The La Plata County Building Department would like your input on proposed revisions and updates to the building codes and standards governing construction in the unincorporated areas of La Plata County. The draft code is available for review and comment online here, using our interactive code software. 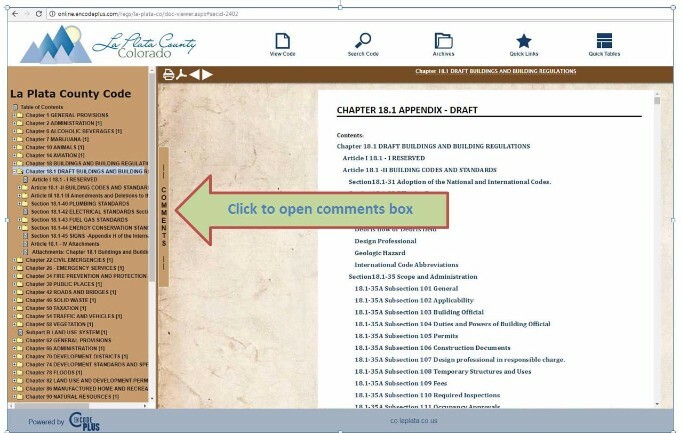 This software allows you to view and comment on the draft code so that the Board of Appeals and Board of County Commissioners can review public input when considering code updates. The guide below describes how to make comments using our online tool. There will also be an opportunity to provide comment to the Board of Appeals, which will make recommendations to the Board of County Commissioners on the proposed code update. The BOA will have a public hearing to take comment from 4:30-7 p.m., Monday, Aug. 28 in the Board Room of the County Administration Building, 1101 E. 2nd Ave., Durango. Any online comments posted prior to that meeting will be shared with the Board of Appeals. 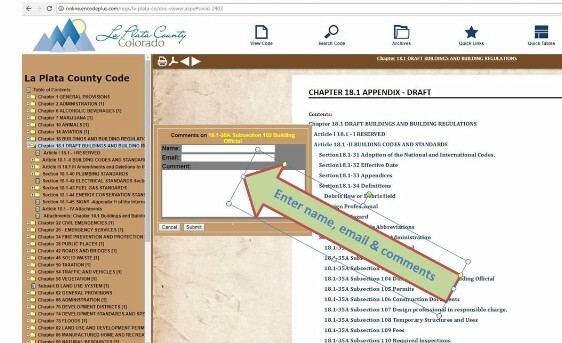 Our online code portal allows you to make comments directly in specific sections of the draft building code. Please use the follow the steps below to comment on the code and ensure that your input appears in the appropriate code section. 4) Click 'submit' and repeat as desired! 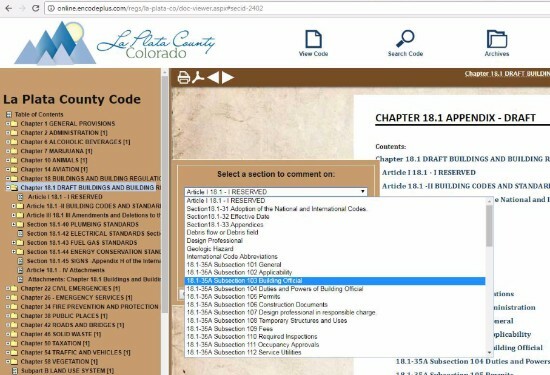 Thank you for your interest in the La Plata County Building Department and code update process. We look forward to your input on this process. If you have any questions, please contact Megan Graham, public affairs officer at (970) 382-3265.